Dr. Weaver and student volunteers survey the shore. It’s the first step for developing a man-made oyster reef that will help buffer the banks from erosion. The words “Indian River Lagoon” used to conjure images of serene waters, frolicking dolphins and wide-smiled anglers boasting their latest catch. Today, residents of Brevard and Indian River County may instead recall news coverage of sedimentary muck, algal blooms and massive fish kills. 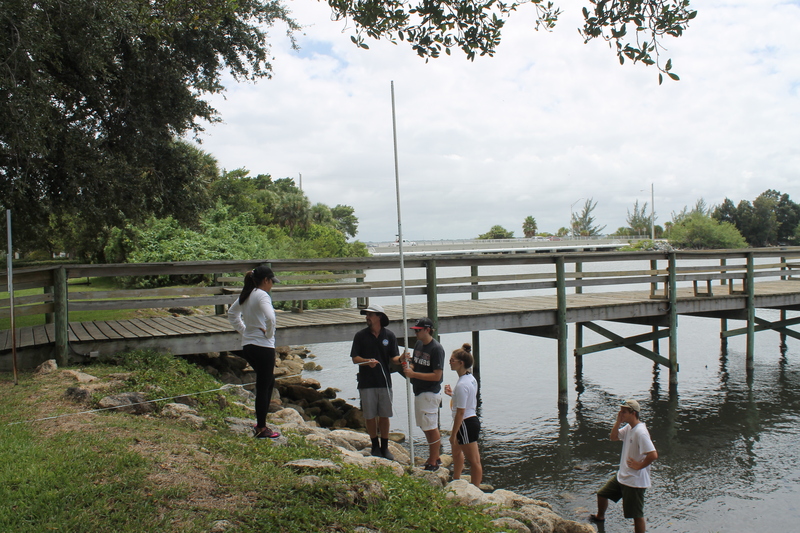 One of the many ways Florida Institute of Technology serves its community is through actionable environmental research—science that makes a difference. 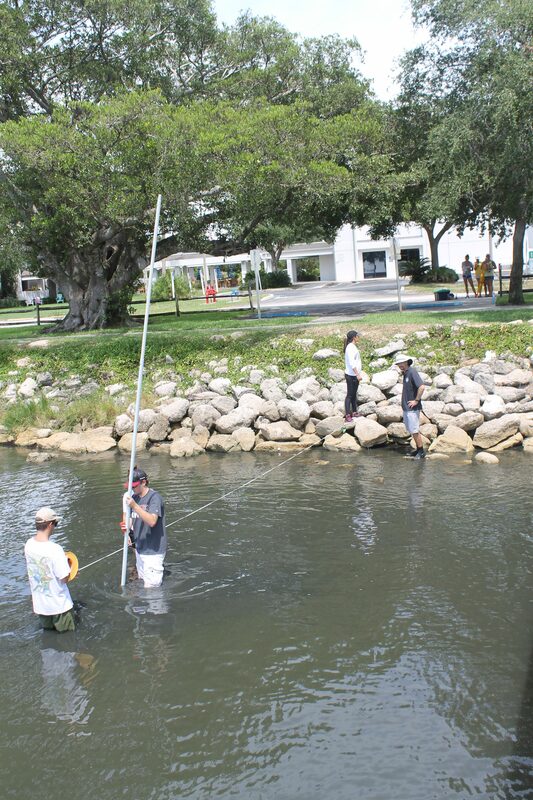 Faculty scientists and engineers at Florida Tech formed the Indian River Lagoon Research Institute (IRLRI) to help bring back some of the lagoon’s natural defenses and restore the estuary’s health. Over the years, pollution and coastal construction have wiped out huge numbers of oyster beds, which act as natural reefs that help block wave energy and prevent shoreline erosion. Oysters themselves act as living filters, removing impurities from the water naturally, efficiently and constantly. To help bring oyster beds back to the shores, the IRLRI’s Living Docks program invites local residents to turn docks and seawalls along the shores of the lagoon into homes for oysters. Participants hang mesh bags filled with used oyster shells from the sides of a dock or seawall and submerged into the water. The presence of the shells attract oyster larvae, which then propagate and grow. A single dock with 37 pilings—with an average of 32 oysters per piling—can filter about 21 million gallons of water per year. 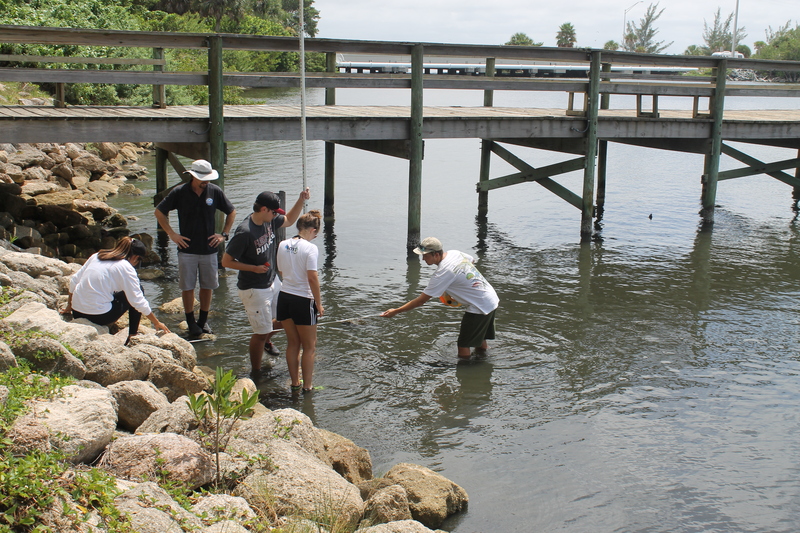 The IRLRI also works with community volunteers on the Living Shoreline project funded by Brevard County. The project will create structures that promote oysters beds near the shoreline as well as planting native grasses and mangroves on the banks to buffer erosion and attract fish. Members of the IRLRI also regularly attend community events to share research and offer sustainable solutions for the revitalization and care of the Indian River Lagoon. For questions regarding IRLRI activities, call 321-674-8936 or contact Robert Weaver at rjweaver@fit.edu.